The Arabian camel stands about 6 feet tall at the shoulders and about 7 feet tall at the top of its hump. Its body is large and has little fatty tissue, other than that concentrated in the hump. It has a long curved neck and long thin legs with thickly padded, knobby knees. The bactrian camel is more sturdily built than the Arabian. Bactrians can carry heavier loads than Arabian camels, but Arabian camels are much faster. Some dromedaries can keep up a pace of 10 miles per hour all day. Dromedaries were used for raiding by the Arabs and in the cavalry corps by the British, Indian, and Egyptian military forces. The thick coat of the camel, which is either sandy-white, yellow-brown, or deep brown, provides insulation against extremes of heat and cold. The coat of the bactrian camel is much thicker than that of the Arabian and is quite shaggy on the humps and neck. The camel’s face has been described as both haughty and stupid-looking. The ears are small, the nose arched, the eyes large and heavily lidded, the mouth wide and thick-lipped, and the lower jaw slightly receded. Despite its lack of beauty, however, the face is well adapted to life on the desert. Double rows of thick eyelashes keep flying sand out of the eyes. 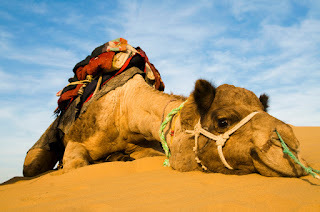 Slitlike nostrils, heavily lined with hair, filter sand and dust out of the air as the camel breathes, and the nostrils can be almost completely closed during a sandstorm. The splayed feet of the camel are divided into two large toes, each of which has a small nail. The bottoms of the feet are protected by thick leathery cushions, rather than by the horny material typical of hooved mammals. The padding of the Arabian camel’s foot is quite flexible, allowing the foot to spread over soft sand, instead of sinking into it. Unlike most other animals, camels walk with a pacing gait. The front and hind legs on the same side of the body are moved forward at the same time, resulting in a side-to-side pitch of the animal’s body as it moves forward. This swaying motion is probably responsible for its popular name, “the ship of the desert”. The camel eats grass and other vegetation. Its stomach is composed of three chambers, the first of which is lined with special pouches that hold partially chewed food, which is returned to the mouth as the cud. Unlike most other ruminants, or cud-chewing animals, camels have front teeth, instead of hard gums in the upper jaw, and they sweep their cud across these teeth. The most distinctive physical feature of the camel is its hump or humps. The hump is composed of connective tissue overlying the backbone. When the animal has eaten, most of the fats that it has absorbed or converted during the digestive process are stored in the hump, making it large and firm. A camel may store up to 80 pounds in its hump or humps, and when little food is available on a long journey, the animal utilizes its stored food. As the fat is used for nourishment, the hump shrinks and becomes flabby.